Sedans are having a rough time right now, though whether or not that means you can score a deal depends on the market that you are shopping in. But if you are looking for something with power, luxury, and reliability under $20,000, your best bet may be the car that got lost in a weird name change: the Infiniti Q40. Brace yourself for some alphabet soup: the Q40 was the artist formerly known as the G37, which itself was an updated version of the excellent G35, arguably the first modern Japanese sport sedan that could truly go toe-to-toe with Germany’s best. The G35 had Nissan’s ubiquitous 3.5-liter VQ series V6 that pumped out a serious 285 horsepower. 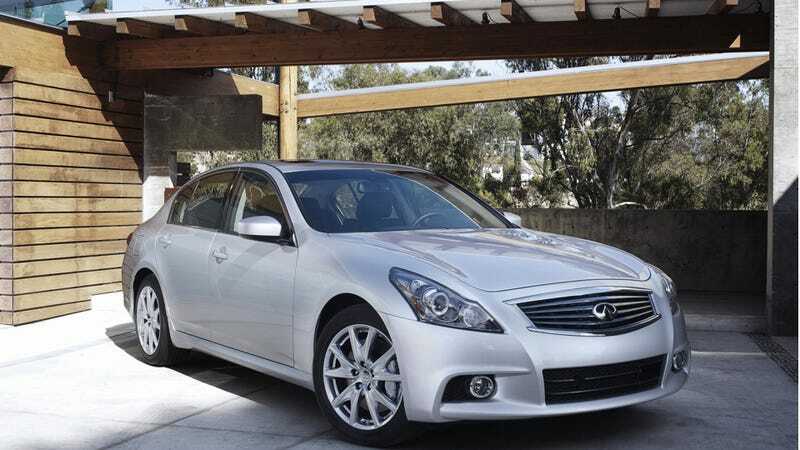 The G37 used the larger 3.7-liter version of the same motor with an output of 328 hp and 269 lb-ft of torque. The G series was replaced by the newer Q50, but the G37 stick around for a bit with a name change as the Q40. So what does all this mean for you? Well, Infiniti made a bunch of Q40s and they weren’t exactly selling like hotcakes, so now you can find nice examples for super cheap. You can get a 2015 model year car with reasonable miles between for less than $16,000. Cars with low miles and Infiniti’s six-year unlimited mile CPO warranty can be found for just under $20,000. The Q40 was available in both rear-wheel drive and all-wheel drive configurations. But the name change from the G37 did bring an unfortunate consequence in that the available six-speed manual was dropped, which is a bummer. Luxury cars depreciate like crazy, and luxury sedans feel the pain even more so now that folks are gravitating towards crossovers. But if you are a buyer on a budget and shopping between $15,000 and $20,000, a luxury car could be a bit of a gamble as most are out of warranty and beyond the threshold of a manufacturer CPO program. But if you are in the market for an affordable four-door, instead of getting some penalty box like a Nissan Sentra, consider a nice Q40 and enjoy the V6 power and luxury. Did You Know You Could Buy A 450 HP Audi RS5 For $40,000?